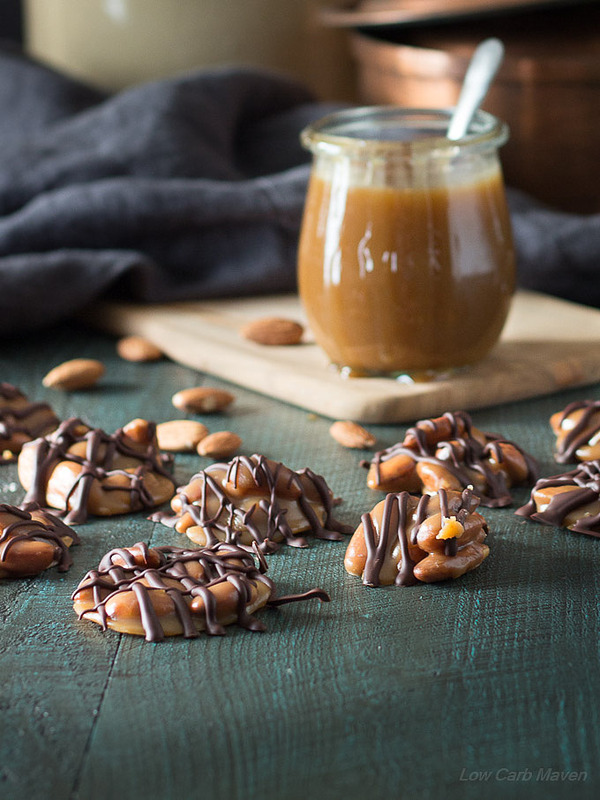 A low carb turtle recipe using sugar free caramel sauce, almonds & sugar free chocolate to make delicious chewy candies suitable for any keto diet. These sugar free caramel candies are simply delicious. My daughter loved them so much that she bragged about them to all of her friends at school. And the mere mention of “no candies for dessert if you don’t eat your vegetables” had my kids cleaning their dinner plates of any stray morsel. I think you’ll enjoy this recipe, too. If you’ve ever wondered how to make caramel sauce, you’re in luck because if you google “how to make caramel sauce” you’ll get 9 million hits of recipes and related content. The recipe for caramel is very simple, consisting of three main ingredients: water, sugar and heavy cream – any other ingredients (sea salt, butter, vanilla, brandy) are used simply to enhance the flavor of the caramel. And, the procedure for making caramel is this: boil the water and sugar together until the sugar browns, then add the heavy cream and stir like crazy. Not hard to do at all. I like this recipe for Easy Homemade Caramel from Stella Parks of Bravetart who wrote a great article for Serious Eats. Making a sugar free and low carb caramel sauce is easy to make, too. The ingredients are similarly few: heavy cream, butter, and erythritol. I also add the Sukrin Fiber Syrup which I feel helps give a superior texture and mouth-feel to the caramel. And, of course, I like to add salt, vanilla, and a little brandy to make it extra special. What I like about this easy low carb caramel recipe is that it can be made without condensed milk, made without corn syrup, and it can be made without a candy thermometer. A big WIN for me! 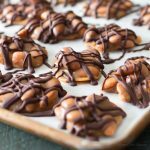 Recently a reader asked if my homemade low carb caramel sauce could be used to make sugar free caramel candies or low carb pecan turtles. 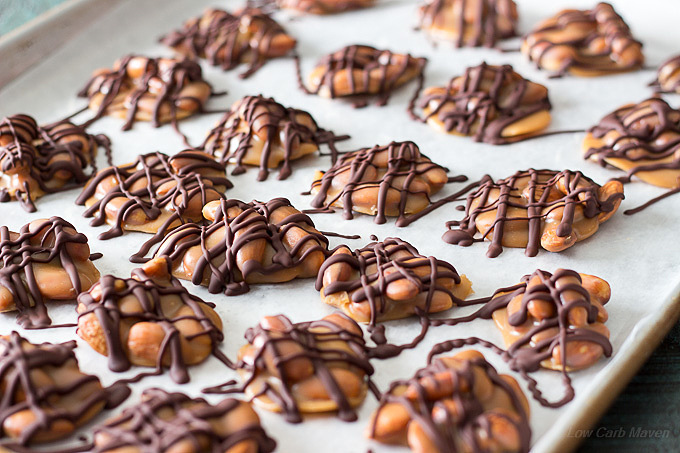 I love caramel candies – especially the combination of caramel, nuts and chocolate so I tweaked the recipe until I hit upon something that worked. 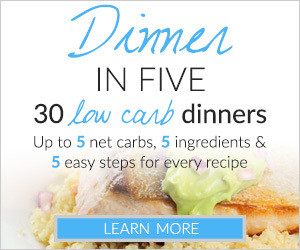 For this low carb turtle recipe it “boiled down” to ingredient proportion and cooking time – literally! The procedure for this sugar free erythritol caramel differs from a traditional caramel recipe but couldn’t be easier. Brown the butter, add the heavy cream, erythritol, and Sukrin fiber syrup and boil for 20 minutes for a softer stickier caramel candy, and 30 minutes for a firmer caramel candy. Don’t skip the fiber syrup. I believe it helps discourage the erythritol from re-crystallizing. If you’ve ever made a dessert with erythritol before only to have it become “crunchy” a few days later, that was the erythritol pulling itself back into crystalline form. To prevent that from happening in my low carb dessert recipes I use less erythritol and augment sweetness with stevia. This low carb caramel candy recipe uses stevia (stevia glycerite) to give it a bump in sweetness – and it needs the extra sweetness to achieve the proper flavor. In anticipation of being asked, I do not think an all Splenda caramel sauce is possible. But, if one is allergic to stevia or particularly sensitive to the taste, a few drops of something like EZ-Sweetz would do the trick to sweeten it nicely. Before I turn you over to the recipe. I want to say something about the sugar free turtle candies you can get in the diabetic section in the grocery store, more specifically the Russel Stover Sugar Free Pecan Delights candies. They taste very good but beware! They contain an ingredient called maltitol to sweeten them. Not only does maltitol raise blood sugar, it also causes gastric distress, as anyone who has had more than two or three of the sugar free candies will most assuredly attest. My recipe is a sugar free candy that does not contain maltitol – your tummy will thank you! Each Low Carb Caramel Turtle is 2 net carbs. 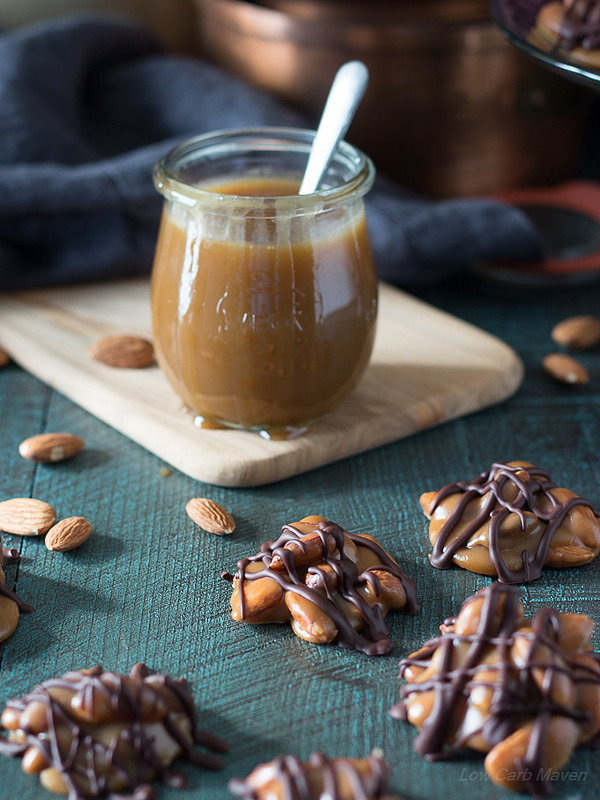 A low carb turtle recipe using sugar free caramel sauce, almonds and sugar free chocolate to make delicious chewy candies suitable for any keto diet. Preheat the oven to 350 degrees. Spread the almonds evenly on a sheet pan and bake for 10-15 minutes, stirring once half way through. Remove from the oven and cool completely. Put the butter into a medium pot oven medium heat. Cook the butter until it just begins to brown. Add the heavy cream, Sukrin Gold, Sukrin Fiber Syrup and salt. Stir to combine and bring up to a boil. If the mixture produces large explosive bubbles, stir to break the big bubbles into little bubbles. This phenomenon will quickly subside. Continue to simmer the caramel mixture over medium-low heat for 20 minutes, but check periodically to make sure it's not burning - all burners are different! Then, remove the caramel from the heat and add the stevia glycerite, vanilla and brandy, stirring to combine. Let the low carb caramel cool for 5 minutes then add the almonds and stir. Line a large sheet pan with a piece of parchment. Using a small dinner spoon, scoop up a spoonful of the caramel and almonds and drop it onto the parchment. Two sheet pans may be needed. 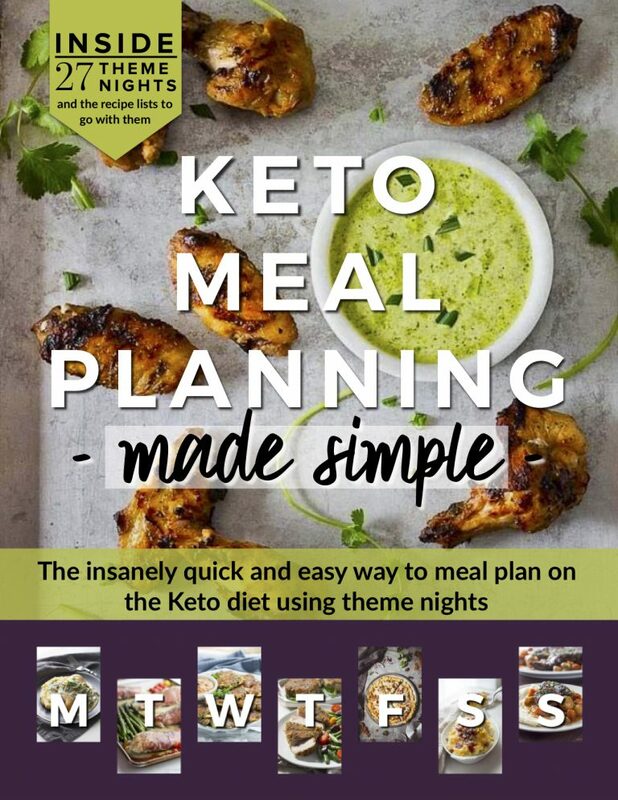 Place the sheet pans with the low carb turtles in the refrigerator for 30 minutes. Place the sugar free chocolate chips in a ceramic bowl over barely simmering water. When melted, drizzle the chocolate over the cold candies. If the chocolate gets cold, return it to the stove to warm again. Store in an airtight container. Makes about 40 low carb turtles at 2 g net carbs each. Can I make it with pecans? Mine were too liquid. Froze and happily eat them that way. I used Lankato Gold Monkfruit 1/2 cup instead of Surkin Gold. Any suggestions for next attempt because there will be one. I just realized I’m about an inch short of having the full 1/3 cup of Surkin fiber. Do you think it will still work. It could be 1/2 in. But I’m short either way. I am ordering some but it will not be here in time for what I need these for. I tried to order from your site on Amazon but they were out so I had to order from another company. I wanted you to get the credit. I tried. I’m so happy this will work yay excited to get started. I do not have the stevia glycerite. Is there something else I can use..? Thanks so much I love,your recipes. I love your recipes excellent. My question is about the stevia glycerite. Is there something else I can use. I have everything else. I can’t wait o make these. Sukrin and similar fiber syrups are well known to spike blood glucose and are unsuitable for me as a diabetic. I noticed you use stevia glycerite, so I was wondering if pour food grade glycerine could be substituted for the Sukrin. I tested 1 tablespoon glycerine on myself after a fast and received no BG spike from it. Could this be used as an ice cream topping? Thin it a little with more water? Your caramel sauce is totally freakin AWESOME! It was easy to make by following your instructions and it turned out perfect! I used chopped pecans in place of almonds since I’m a southern gal. Thank you so much for this recipe. Since going Keto, I’ve missed my holiday sweets. do you think inulin fiber or isomalt sugar would stop the erythritol from crystalising? 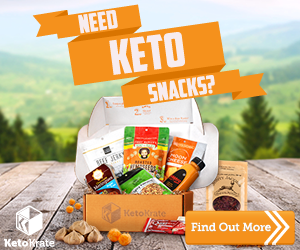 I’m gonna have to try these but leave out the lousy erythritol as it all the erythritol based products seems to make me ill plus I’m one of those who can’t do stevia either. So hopefully I can do this with Splenda which doesn’t bother me. I made these last night. I basically followed the recipe and had them in the fridge and then even put them in the freezer overnight and the caramel has still not set. It tastes delicious but the caramel is still runny and it doesn’t make a candy… just caramel coated almonds that you have to put in a bowl. The only thing I changed in the recipe is that I used 1/2 cup of the monkfruit syrup and 1/4 cup of Swerve instead of the other way around… just because I’m not a fan of the aftertaste of erythritol. Would it make that much of a difference and cause the candies not to set? Maybe I stirred it too much during the 20 minutes it was simmering… I was paranoid that it was going to burn. I made these with pecans. OMG! Game changer! I’ll have to hide these from myself, they are that good! Not sure if the calories per serving is for just one 🐢. Please clarify. Do you think you could substitute the heavy cream for something coconut? I have a dairy restriction. What is the serving size? Just checking for the carb amount per candy. Is there a substitute you could use for the brandy and still have them turn out? Am I the only one who doesn’t see erithritol in this recipe?!? I made these and they were great but I had to guess at how much erythritol to use. I think I ended up with a little under 1/2 cup of swerve by adding and tasting. Oh ok. I had never heard of Sukrin before this recipe and I ordered and used sukrin fiber syrup clear and sukrin fiber syrup gold, as well as swerve. I just today saw the sukrin brown sugar on Amazon so I will have to get some and try it again correctly. These turtles did have the best flavor of any low carb sweets I have made so far but they did got me out of ketosis, maybe because I ate too many! If you use Pecans instead of the Almonds would that change Nutritional info much? And do you think they will be just as good? What is Sukrin Fiber Syrup? I’ve never heard of it before. The Recipe looks great. I started Low Carb eating in April, so good, so far. But I have a terrible sweet tooth. And these look like delicious. Do you think the Caramel sauce could be used to make caramel corn? SG syrup raises everyone’s sugar level more than sugar does! On the brandy do you use the alcohol brandy or candy extract that is brandy flavored? Great recipe! I’m wondering if 3/4 c. of Allulose can be used for the Carmel instead? I know Maria Emmrich used Allulose to make Carmel, but wonder if the proportions would be the same to get that hard Carmel consistency? Thanks!! Also wondering if these could be frozen to keep linger? Pop one out and defrost a bit? With the Allulose I don’t believe it will crystallize. Hi, do you think glycerin would help the crystallizing problem also? Serving size for this is one ??? This is one of my favorites to satisfy sweet tooth. I end up eating too much so I don’t make as often as I like. Still a better alternative to sugar!! 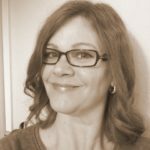 Are you deducting the 3grams of fiber to make the carb count? I love turtles! This is a great recipe for sugar-free caramel. Good to know that maltitol raises your blood sugar! Chocolate and caramel – so delicious! These look amazing! So interesting that the fibre syrup sorts out the problem with the crystallisation! Sukrin have not got it available at this time in the UK ,so I can’t wait. Your turtles look to die for. I wish I could snack on one right now. Wow these look SO perfect! YUM! I have xylit at home which is erythrit in German, I suppose that is the same thing as erythritol… I don’t have or ever heard of the fiber syrup before. Could I replace that with maple syrup for instance? No way! I literally just did a web search for low carb turtles and BOOM!! this popped up! Thank you! I would eat all my veggies for these too! I don’t even own a candy thermometer, so I’m glad I don’t need one. Turtle are a favorite.